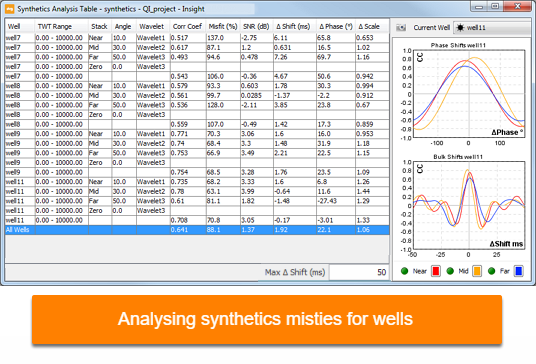 It is possible to analyse synthetics misties of the wells in the Synthetics Analysis Table. This feature allows you to analyse the misties between the well synthetics and seismic synthetics in a table that displays attributes including Correlation Coefficient, Misfit, SNR, Shift, Phase, and Scale. The time range which the values are measured over is displayed in the table under the TWT Range column. You can adjust the time range by changing the default window of interest or specifying a window of interest for a particular well (see Default Window Of Interest and Overriding the Window of Interest). You can also view the Correlation Coefficient (CC) vs Phase Rotation and CC vs Bulk Shift graphs for a range of phase rotations and bulk shifts. The graphs allow you to analyse the optimum phase rotation and bulk shift in synthetics. Under the Analysis section, click Show Analysis Table. The Synthetics Analysis Table, the CC vs Phase Rotation and CC vs Bulk Shift graphs will be displayed. Note: Alternatively, click on the View menu in Insight's Control Panel and select Synthetics Analysis Table. As you adjust the wavelet parameters in the Wavelet tab in Insight’s Control Panel, other parameters in the Synthetic and Well tabs in the Synthetics window, and/or edit the checkshots as part of the quality checking measures, the Synthetics Analysis Table and the correlation coefficient graphs will be updated interactively. At the bottom of the Synthetics Analysis Table, set the maximum shift to be displayed. These graphs show the correlation between the synthetic and seismic as different phase and time shifts are applied. Current Well — Select the well to evaluate. The synthetics window is updated to match the selection. Camera icon — Click to capture a screenshot of the window (see Taking Screen Captures). Green/amber circle — Click to hide or display the correlation curves for individual synthetic tests. Colour patch — Click to assign the line colour for a synthetic test.